A film that has struck my attention for months now of which trailer I had failed to write a review for is Cowboys & Aliens, a 2011 film starring Daniel Craig and Harrison Ford. The film revolves in the 1800s around Craig’s character not remembering what has happened to him, awakening with a mysterious device around his wrist. Eventually, he comes across the path of Ford’s character and this is when the film appears to pick up. Aliens suddenly appear in the skies and the cowboys are attacked. Now, enemies are forced to band together to fight this mysterious and deadly force before humans and annihilated. The film looks to be a great Summer Flick with great action and some humor. I particularly enjoy how in the trailer, Ford gives this nod to Craig just before Craig leaps onto an alien vessel from a cliff, a move audiences had witnessed performed by Ford’s character, Indiana Jones 22 years earlier. 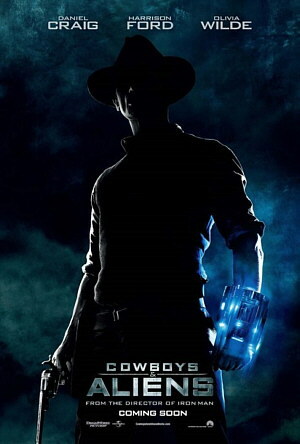 Comments for “Cowboys & Aliens” (2011) – A Trailer Review are now closed.